William Reinhardt Elliott (1889-1976) was born on September 6, 1889, at Fremont, Sandusky, Ohio, the son of German immigrants Charles Wilson Elliott (1855-1893) and Frederica Grob Elliott (1855-1930). He was the owner of Elliott's Wonderland, Curios, Coins, Stamps, Indian Relics, 901 West Sandusky Street, Findlay, Ohio. His earliest known career was as a bookkeeper in 1910 for a Motor Works in Detroit, Wayne, Michigan. He then returned to Ohio and worked for the Toledo Post Office since at least 1917 (according to his Draft Card). This developed his interest in collecting stamps, covers and post cards. He then moved to Findlay and worked for the Post Office there. In October 1924 the local newspaper Findlay Morning Republican, ran a story about his reception of a post card mailed from Dresden, Germany that traveled by the famous German Zeppelin ZR-R, that arrived at Findlay in just 5 days making a new world record. The post card was franked by five Zeppelin postage stamps and included ZR-3 markings. On January 12, 1910, he married Ina May Burr Elliott (1889-1959), and they had six children : Samuel David (1908-1914), Clifford (1911-1992), Carlton Luther (1915-1983), Leda (1926-1975), and William Byrd, Jr. (1928-2007), and ?. Fig. 1. Elliott's Wonderland, Curios, Coins, Stamps, Indian Relics. Duplex cancel, franked with Scott #720 Washington 3 Cents, deep purple, postmarked November 30, 1934, Findlay, Ohio. 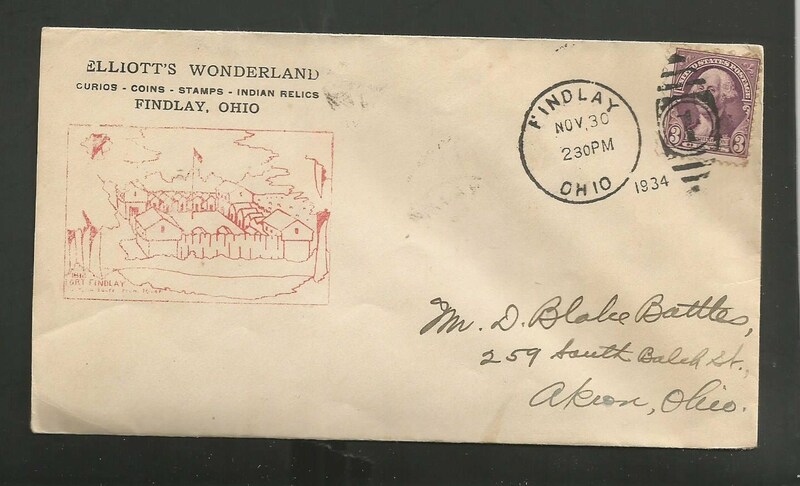 Cacheted envelope stamped in red ink with illustration of Fort Findlay, Ohio 1812, situated along the Blanchard River. This is one of many various cacheted envelopes he sold. The Historic Preservation Guild of Hancock County, Ohio erected a Historical Marker of Fort Findlay in 1978. Elliott's cachet was designed and conserved this historic site 44 years earlier. — Elliott's Wonderland. Findlay, Ohio. In 1933 he advertised in Hobbies Magazine selling cacheted covers : Washington Crossing the Delaware, or Valley Forge, PA with Washington Kneeling in prayer, each for 25 cents, and the Dedication of the Findlay Post Office for only 10 cents. In May 1935 the year's big event at Findlay was the Carnival held at the Washington grade school. Elliott was in charge of the display room for antiques and curios. In 1935, the Republican Courier ran the advertisement for his auction held by Worley Swisher, auctioneer, of his complete inventory of stamps, coins, curios, and antiques. Everything was sold so he could move to California where he was transferred to the Los Angeles Post Office, Los Angeles, California, where he and his family remained the rest of their lives. After the death of his wife of 49 years, Ina in 1959, he remarried to June Holly Kindle. He died on April 25, 1976 at Lakewood, Los Angeles, California. Thanks to Justin Crawfis, Findlay-Hancock County Public Library, for his gracious assistance and research on the 1935 auction.